Kenwood have vast experience in large scale projects from full property treatments during renovation, or basement waterproofing to large commercial spaces. 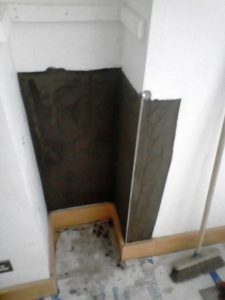 Sometimes damp is a more localised problem that does not require such extensive works. Kenwood are here to deal with Damp problems both large and small scale. This was the case with the latest project for a purchaser of a ground floor flat in London. 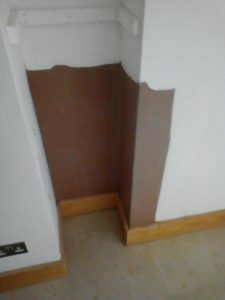 A small area of dampness was found to be affecting a wall within the kitchen area along with evidence of woodworm to the under stairs cupboard. Treatment for woodworm involves the spraying of all accessible timbers with Kenwood pesticide. The advantage of Kenwood’s treatment is that the property must only be vacant for 1 hour after application, thus causing as little disruption to occupants as possible.